Field Day is the most popular on-the-air operating event in amateur radio. It’s an opportunity for NARL members to hone our emergency communications preparedness skills and have fun. We turn an unprepared site into a fully operational ham radio station for 24 hours on the fourth full weekend in June. Ham clubs all across the US do the same and we follow contest rules to rack up points as a club. Enter either from Garfield or from Browning Ave. parking lot. 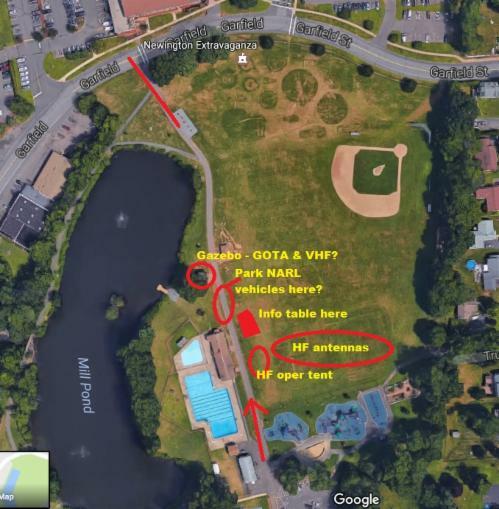 Campers may park on the paved path, all others please make deliveries or pickups, then move vehicle to parking lots on north or south sides of the park. This site is open to the public and we encourage and invite visitors. Stop by to learn about ham radio, get on the air, or help us make contest points!